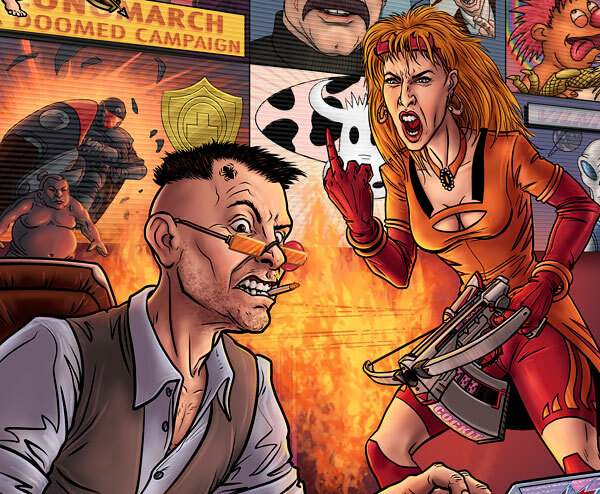 Transmetropolitan Sneak Peek – Now in Color! After the five previous sneak peeks of my pieces for the upcoming Transmet Art Book, I discovered a number of people thought the final images were going to remain black & white. 1) Because I’d like to save the full image for those of you who bought the book. 2) The full image is OMG NSFW! Seriously. If you’ve read Transmetropolitan, you may recognize that this is the younger version of Spider from several years before issue #1. The other person is his wife, better known brusquely as The Wife. Their relationship could be described as ‘troubled’ in much the same way as the void of space could be described as ‘nippy’. This image is entirely conjecture extrapolated from a few scraps of info from the comic book, but that’s what made it so much fun. I knew a lot of artists were going to be focusing on events or people from within the timespan of the series, so I decided to set mine outside of that period. That might give you a clue as to the nature of the other half of my double page image. I had a blast with these pieces and it was great returning to comic book work after all these years. Also, having read the Transmet series a number of times I took a little bit of fiendish joy filling the images with Easter eggs. And somewhere in my double page spread, I hid one of the hallmark three-eyed smiley face symbols. It won’t be easy to find. Have fun hunting for it, the book should be with you soon. I’m looking forward to getting my copy!